"Dr. Strimlan has really prepared me for a lot. To see things I’ve been taught in class be applied in real cases is reassuring to say the least." 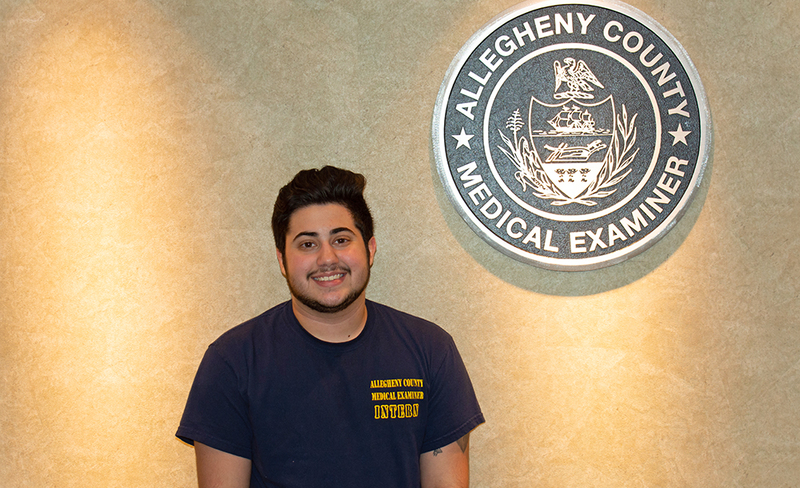 How did you land an internship with the Allegheny County Medical Examiner’s Office? It really is the desired internship for students in forensic science and associating fields. The Allegheny County Medical Examiner's Office has an internship program for each semester in which they take seven interns — and three out of the seven are Point Park students. It’s kind of scary because you really just submit your papers and then hope for the best. They pick one intern for each of the labs and three for the autopsy department. I was lucky enough to be chosen for the biology lab. Tell us about the work you do there and how your forensic science classes have helped you. It typically depends on the day for the tasks that I do. One day for three hours I observed a knife be processed from a possible stabbing. Granted, it was a utility knife so there was more than one blade to examine. Another day I could be filling out evidence request forms and photocopying lab results. I take pride in even doing the small tasks because it allows for the bigger things to get done. Dr. Strimlan has really prepared me for a lot. To see things I’ve been taught in class be applied in real cases is reassuring to say the least. What inspired you to pursue a career in forensic science? I’ve always been interested in forensics since I love science and the criminal justice field. It’s like the perfect marriage of the two — being behind the scenes relying on the science while still getting the criminal justice "feel." It might sound silly but I used to play a lot of crime scene games as well. They’re obviously not super factual, but hey, I did learn what luminol was when I was 10! As a senior at Point Park, what would you like to accomplish before graduating? I’d like to have a little more solid idea of where I’d like to be in the realm of forensics. It’s a pretty broad field that encases all different types of jobs from anything like computer science to firearms and everything in between. I’d like to figure out maybe my top three areas of interest. I also want to make sure I’m passing on the Gender and Sexuality Spectrum Alliance Club into a new board of capable hands. It was started by a friend of mine who graduated last year and I want to make sure that this club remains intact for current and future students. Ideally, I’d like to work in the Allegheny County Medical Examiner’s Office, if not this one, then one in a different county or state. I lean towards biology more, but the great thing about this internship is that every Wednesday we have a lecture and a tour of a different section in the building, so who knows, maybe I’ll fall in love with a different section.